In back of the National Maritime Museum is Observatory Hill in Greenwich Park. It is not a very high hill but the walk up the paved path is rather steep. But even if you have no interest in astronomy, the climb is worth it. 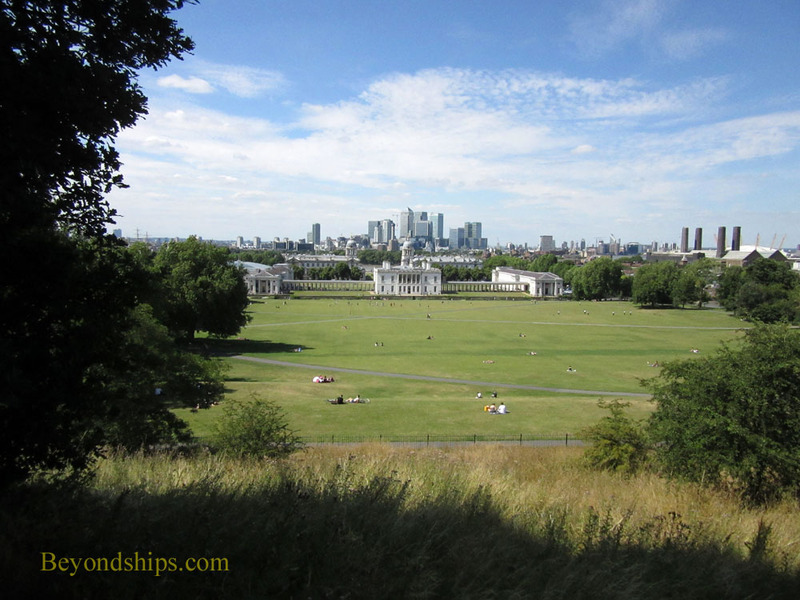 Not only is the Royal Observatory on the crest of the hill but from there you have a magnificent view of Maritime Greenwich and much of the rest of London. ﻿Above: Looking down towards the Queen's House from Observatory Hill. At the top of the hill is the complex of buildings that comprises the Royal Observatory Greenwich. Among other things, this site is where the eastern and western hemispheres meet and where each new day begins. In 1675, King Charles II founded the Royal Observatory. While Charles was interested in science as an intellectual pursuit, there were solid commercial and military reasons for this project. A mariner can navigate by observing the night sky. The more accurate his charts of the night sky, the more accurately the mariner can navigate. Inasmuch as Britain was a maritime nation, Charles saw that his realm would benefit by having an institution that could create accurate maps of the heavens for use in navigation. The Observatory was built on the site of Greenwich Castle where King Henry VIII used to house his mistresses so they would be conveniently close to his favorite residence, Greenwich Palace. For the Observatory, however, a new building was designed by Sir Christopher Wren. It is called Flamsteed House, after the first Astronomer Royal John Flamsteed. Inside Flamsteed House, visitors can see the elegant Octagonal Room, which was designed with large windows so that the Astronomer Royal could make his observations. However, since none of the walls are aligned with the Prime Meridian it proved not to be particularly useful and much of the astronomical work had to be carried out in a shed in the garden. On top of the Octagonal Room is the Time Ball. Every day (wind conditions permitting) the ball is raised up its mast and at 1 p.m. exactly it is dropped. This was one of the first public time signals in Britain. 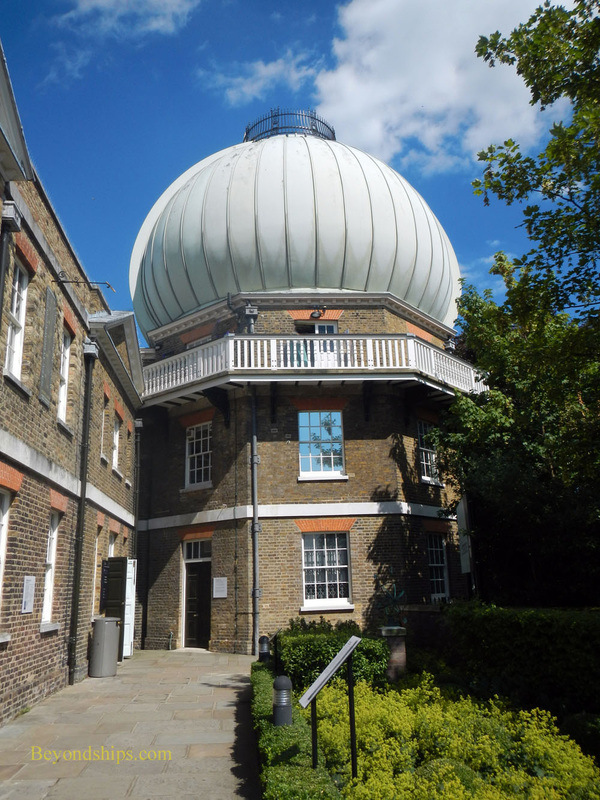 Also, in the onion-shaped dome at Flamsteed House is the Great Equatorial Telescope. Added in 1893, it was intended to keep the Observatory at the forefront of astronomical observation. It is a 28 inch refracting telescope, the largest of its kind in the UK and the seventh largest in the world. Aligned with the equator, it is designed to move at the speed of the earth's rotation thus enabling it to fix on a given star as it moves across the night sky. Although no longer used for research, the telescope continues to be used for educational purposes. In the courtyard outside Flamsteed House, visitors can straddle a piece of stainless steel embedded in the ground that marks the Prime Meridian. This is the line of longitude that divides the eastern and western hemispheres. Since the Prime Meridian is an arbitrary line, it could have been placed anywhere in the world. It is officially located at Greenwich by international agreement primarily because the charts developed by Flamsteed and his successors placed the Prime Meridian there. Inasmuch as these charts were in such widespread use throughout the world in 1884 when the decision was made, it would have caused too much disruption to have placed the Prime Meridian anywhere else. 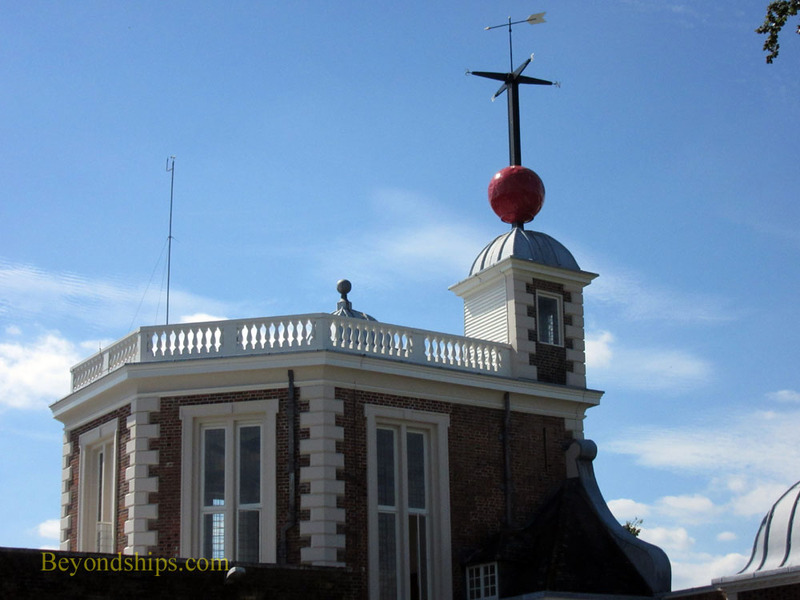 ﻿Above: The Octagonal Room of Flamsteed House with the Time Ball atop. The Observatory is also the home of Greenwich Mean Time. Until the 1850s, every country and, indeed, every community kept its own time. However, the advent of railways and instantaneous communication made it necessary to have uniform timekeeping around the globe. In the second half of the 19th century, railways began using Greenwich Mean Time as the standard throughout Britain and it was officially adopted in 1880. Gradually, countries around the world began to measure their time in relation to GMT. Inasmuch as the accurate measurement of time has traditionally been vital to the calculation of longitude, much work was done at Greenwich to improve time measurement. 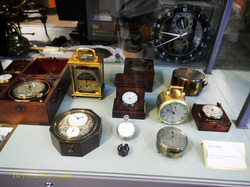 Flamsteed House has several galleries relating to time measurement. In addition to Flamsteed House, several other buildings at the Observatory are open to the public. The Astronomy Centre has exhibits about various aspects of the cosmos including a 4.5 billion year old meteorite. 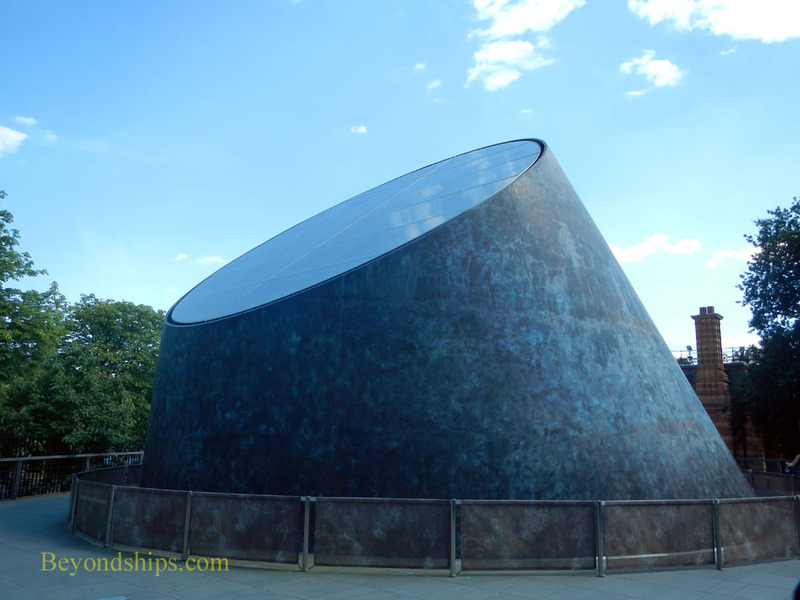 A modern building, the Peter Harrison Planetarium, is London's only planetarium. Its seeks to present a simulation of the universe in a totally immersive environment. Shows that include images from space craft are projected onto a dome above the audience using high definition projection. While most shows are pre-recorded, the “Sky Tonight” is with a live astronomer. You cannot get a complete view of Maritime Greenwich from the south bank of the Thames. In order to get the iconic view that you see in films and on postcards, you have to cross the river. That means using the Greenwich Foot Tunnel. 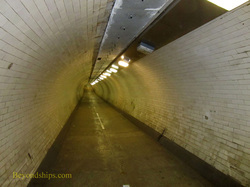 Opened in 1902, the Greenwich Foot Tunnel is 1,215 feet long and links Greenwich and the Isle of Dogs. It was built in order to make it easier for working class men from the south side of the river to reach their jobs in the London docks on the north side. Now that the Docklands area has become an upscale financial center, the laborers are gone and the tunnel is used primarily for recreational purposes. The original tunnel was made of a cast iron framework lined with concrete, which was surfaced with tiles. Damage from a bomb dropped during World War II was repaired using steel and concrete. However, the tunnel maintains a late Victorian atmosphere. You enter via a small domed building near the Cutty Sark. Inside, there is an elevator (lift) to take you down to the tunnel or you can take the helical staircase. A similar arrangement takes you up at the other end of the tunnel. Crossing is a five to ten minute walk. Because of its location under the river, the tunnel is cool even on hot days. At the north end of the tunnel is a small park called Island Gardens. From its promenade along the river, you get a panoramic view of the Old Naval College, the Queen's House and Observatory Hill beyond. You see the success of Wren's effort to bring these disparate elements together into an elegant whole. 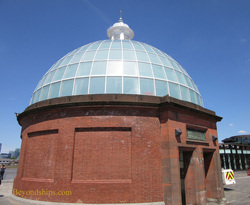 The Greenwich Foot Tunnel is open daily and is free.